Have I said jump? I discovered the "jump" function 1.5 years into blogging and I am still confused by the fact that some very well read, older blogs don't use it. It is the function on your start page which shows on the the first part of a post. How frustrating is that to scroll down pages to get to the nest post right? At least for me. I was planning for a few "blogger, how-to" posts but life got in the way. Maybe next year. Back to our topic shall we? The new compact foundation of Guerlain with rejuvenating effect, SPF 15 (UVA/UVB) and light reflecting particles is called Parure Gold Gold Radiance Powder Foundation. Starting with the compact, I love the design. Once you open the lid the powder is lifted forming an angle while the lower compartment with a black sponge is revealed. How cool is that. After I got those, I kept playing with it, on/off haha, big fan of the packaging. The shades I received from Guerlain Parure Gold Gold Radiance Powder Foundation were both not my perfect match. #03 is way too dark and didn't even make sense to try it on the face. I gave it away to a friend. #00 is slightly lighter for my complexion at the moment but as the winter gets longer, it will be a match. I found out that #00 in powder foundation is a little darker than the fluid one. On my face it looks natural, not too light. To tell the truth up front, I have never ben a powder foundation fan although whenever I wear one of mine, I end up liking the light feel of it together with the ease to remove it at night. My hesitation is because of my dry areas on the face which are sometimes emphasized due to the powdery overlay. 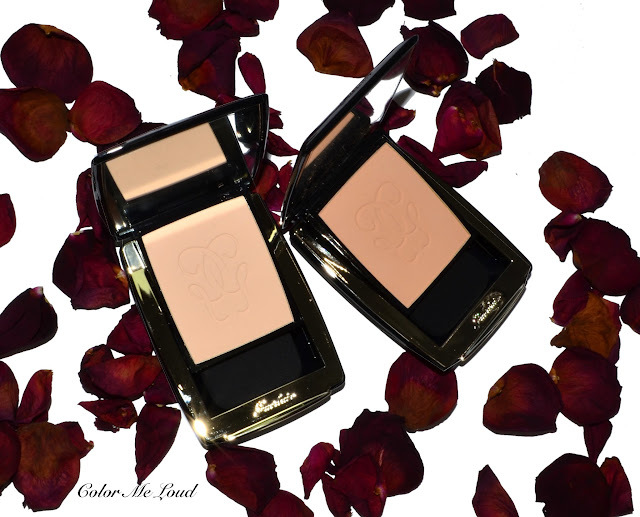 Worn on its own over a make-up base or a moisturizer, Guerlain Parure Gold Gold Radiance Powder Foundation doesn't emphasize the dryness of my skin, looks natural and my skin tone is nicely evened out. If I wear it over Parure Foundation or any other foundation, it looks too powdery for my taste. It is not the fault of the compact though, it is me, I prefer minimal coverage and no hint of powder even if it is only seen with a magnifying mirror. Am I crazy? 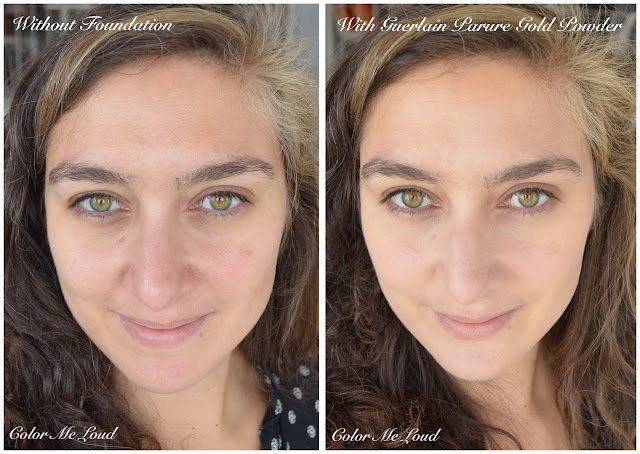 What Guerlain Parure Gold Gold Radiance Powder Foundation does so good is to give you a natural skin like glow. This is the claim of the foundation which is reflected in its name "gold radiance", yes please. love it! 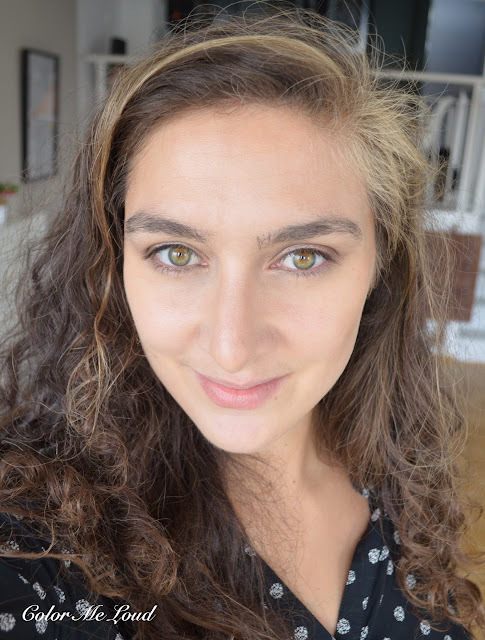 Here is an FOTD with me which you have seen recently here. I was wearing Parure Gold Radiance Powder #00 all over the face over my moisturizer for the FOTD. I also like spraying some hydrating mist before applying powders. Finishing up with a mist is also great to make powders appear less powdery, not that Guerlain Parure needs it but just a tip while we are on this topic. On and Parure Gold Compact Foundation stays very long on me too. Final thoughts: Guerlain Parure Gold Gold Radiance Powder Foundation impresses with its high tech chic package, natural radiant skin like finish and light weight and long lasting formula. With my dry skin and physiological intolerance to anything powdery, I don't prefer to wear it over my liquid foundation but I imagine that being a great option for a special event when you need a flawless skin. All in all definitely recommended for powder compact lovers. Do you prefer compact or liquid foundation? Why? That looks really lovely on you, even the colour looks good! I love powder foundations in the summer; my favourite is this Laura Mercier one that I don't know the name of right now. It's in a round compact. For some reason I was all about either tinted moisturiser or Les beiges powder over nothing this summer, though. I think the shades in the compact version is deeper than the fluid version or maybe because of the transparency 00 appear to be a match for me. Either way I was a little disappointed to get the wrong shade but then I was glad that it worked. You are right, in summer I like compact foundations more. The reason for me is that because my skin is more hydrated, oilier and these foundations look more natural. If my skin is dry that they, a compact foundations looks like desert on my face lol. Wow, you can get along with Les Beiges over nothing, envy! I truly like both liquid and powder foundation! 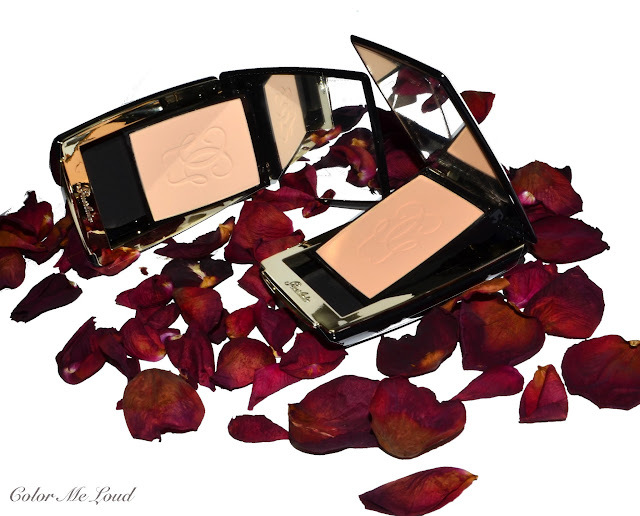 I find the compact very convenient to carry along in my purse for touch ups throughout the day. I have this compact and love it. I haven't understood, though, why it is so much more expensive than Guerlain's previous powder foundation. They are both good. I do not find that the parure gold with light reflecting particles is any better than the previous formulation. Hi Sara, I don't know why I missed this before! But I love this powder to bits!! Both the old version and this new one! I am a little bit of a nut, I actually use powder foundations as finishing powders sometimes, of course I skip the sponge entirely and use my big fluffy chikuhodo. Perhaps you can try that? I don't find it looking powdery at all even worn over its fluid sibling! Inam looking for a compact foundation for summers. Which one would you recommend CHANEL or guerlain?